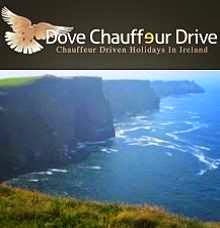 HOLIDAYS in IRELAND: Connemara chauffeurdriven tour with Dovechauffeurdrive and Dave Hogan. Connemara chauffeurdriven tour with Dovechauffeurdrive and Dave Hogan. Today (Tuesday), we made our way into Connemara, the area we know as "God's Country", and also widely known as "The Quiet Man" country. Many of the areas featured in that famous movie were located here. In the above picture, we have, from the left, Donna, Gary, Paula, and Stan, with the Maamturk mountains in the background. These black faced mountain sheep, sentries on duty, in the Inagh Valley. A lovely picture of Paula, with the mountains, and Lough Inagh, in the background. Here we have Gary, nearest to the camera, and Stan, in the distance, trying out their sheep herding skills, in the Inagh valley. Looks like the sheep escaped, as we now have the full group together once again. Here we have the magnificent Kylemore Abbey, a castle, later to become an abbey, and famous girls school , and now just a visitor centre, awaiting its next transition, whatever that may be. The school has been closed, due to a shortage of nuns, who ran this school so successfully for many years. A sad end to another great story. My friends, pictured with the lake and the Castle in the background. Another lovely picture of Gary and Paula at the castle. Well i could not leave out Donna and Stan, and once again, what a lovely picture. Peat, from the peat bogs of Connemara, was an invaluable asset to the poverty stricken people in this barren region, and here we have stacks of peat by the roadside, at the entrance to one of the bogs not far from the town of Clifden. What a really lovely picture of Donna, seen here, surrounded by a hillside of magnificent colorful heather, on the road to Roundstone. Roundstone, is a really lovely little harbour town on the coast road near Clifden, and here we have Donna and Paula pictured, with the harbour and mountains in the background. The old railway line from Galway has been closed for many years now, and here we have Stan, pictured admiring what was once upon a time, the old Balinahinch Railway station on that line. It is now a private home, but how beautifully they has restored it.